Even if you've never been to Ireland, you've probably had a drink in a pub that was completely built there. It would've been crafted in a workshop outside of Dublin, by Irishmen whose families have been building pubs for generations. Everything from the light fixtures to the floorboards would've been packed in a freight container and shipped halfway 'round the world by one of a handful of companies that exports Erin's most precious man-made resource: the "authentic" Irish pub. If the pub is suddenly spinning around you, grab hold of that bar top and have a dram, 'cause it's totally true. For hundreds of years after Ireland’s oldest pub starting serving in the 12th century, anywhere Irish immigrants wound up -- driven by famine, The Troubles, or just the desire for more spacious golf courses -- pubs appeared. These are NOT the Guinness oases we’re talking about. They were built from local materials and tended to just look like “normal” bars, only with “McManus” on the sign. But by the end of the '80s, Irish pub-preneurs had set their sights on a slightly bigger market: the entire world. Quietly infiltrating (and in a few cases, pioneering) the indigenous boozing habits of far-flung locales like Siberia, Dubai, and Bermuda, the pot-o’-gold was North America, where would-be publicans started importing Irish-made establishments like hot cakes in the '90s & aughts. Fueled by Guinness’ rise and St. Patrick’s Day’s glorious metamorphosis from religious observance to international bacchanal, Ireland’s pub-industrial complex has been on a roll ever since -- and most of the world’s pub lovers are none the wiser. For Irish-manufactured pubs, we jump bravely backward in time to late-’80s/early-’90s Italy, where a soccer tournament was being held. Maybe it was the World Cup, maybe it was a smaller tournament. Guinness has washed away the details and even the years. Whatever it was, it drew a gaggle of outgoing Gaels, who immediately made an expat’s Irish pub the most popular bar in town. Darren Fagan, the US representative of Irish Pub Co., a Dublin consultancy that’s built and installed over 1,000 pubs since 1991, recounts/explains/describes/says there was a eureka moment: people everywhere clearly loved drinking in Irish pubs, and no one knew how to build ‘em better, more authentic, and more inviting than Irishmen. Why not make it an exporting business? A Guinness spokesperson who asked to remain anonymous confirmed the Italian futbol foundations, but couldn't be sure if this great moment in drinking history happened at the 1990 Cup or just another contest in which Ireland played around the same time. Then again, at least one pub-maker was already exporting pubs by Cup kickoff: in 1988, GGD Global retrofitted Murphy’s Bleachers in Chicago. But all signs point to this serendipitous soccer moment as a flashpoint. Forget soccer. How the hell does this all work? Shipping a pub halfway around the world is a veritable Irish jig of communication, timing, and local knowledge. It takes money (between $1-4 million), a gutted building (known as a “shell”), and careful orchestration by a seasoned player like Fagan or Jonathan Heverin, a co-founder of rival firm OL Design & Build. 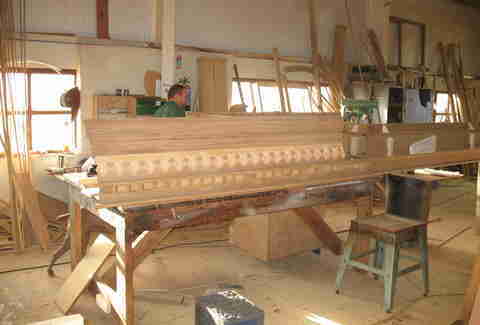 Each project has its own intricacies and snags, but the process generally takes three to nine months. Here’s how it goes down. Local real estate laws being... well, local real estate laws, Irish pub-makers never get directly involved in shell construction. But as soon as a bar owner gets permits, pub-builders like Fagan and Heverin will go to work on site, taking measurements, consulting on budgets, and flexing decades of expertise to shape the proprietor’s foamy vision into a build-able blueprint. These layouts are approximately 1,000x more involved/permanent than any St. Paddy's decorations you've ever haphazardly strewn about. Historically, Fagan explained, “most pubs in Ireland would be multi-purpose. They could be the [village’s] post office, the funeral parlor. Most of the time, it was the grocery store.” Want more than one scene? No problem: Kildare’s Manayunk, one of five Philly-area pubs built by IPCo., is crammed full of themes like shop, brewery, Gaelic, cottage, and Victorian. 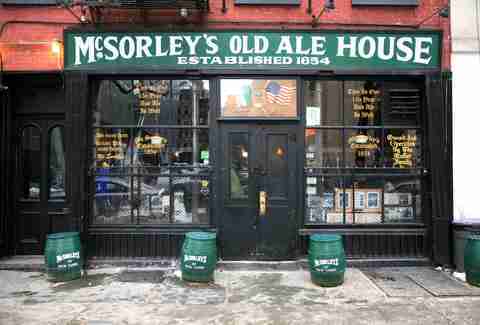 As for the vibe, Heverin says a welcoming atmosphere is key -- especially for women, who were historically discouraged (or outright banned; pubs like Manhattan’s McSorley’s was notoriously men-only ‘til 1970) from sidling up to Irish-tended bars because they were known as grimy, unwelcoming places. Big windows, polished surfaces, and light-colored upholstery are just a few ways Heverin engineers his pub designs to be extra friendly. 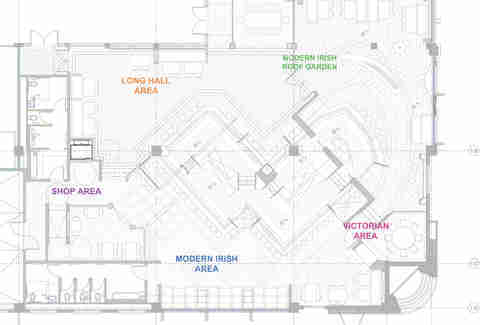 Layout approved, up to 30 craftsmen will begin cranking out the interior components back in Ireland -- stained glass windows, rustic floorboards, leather banquettes, and whatever else the blueprint calls for. As the future pub’s trusted vessel for booze storage and super-cool leans when you’re talking to a lass, the bar is “the primary feature. Everything else gets laid out from there,” explains Kieran McGill, CEO of Fado Pubs, which owns 10 outposts throughout the country built by IPCo. 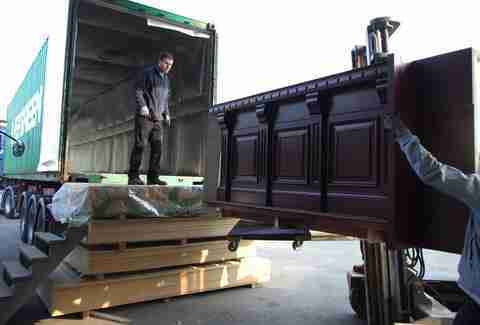 Ireland’s timber is too soft for bar tops, so generations-old Irish artisans carve and lathe pieces from imported woods (Scandinavian pine, mahogany...), then put it all together for a warehouse dry-run to make sure the millwork & tiling fits exactly as planned. Or, when Irish eyes are really smilin’, an already-existing pub might be looking to sell off its bar. 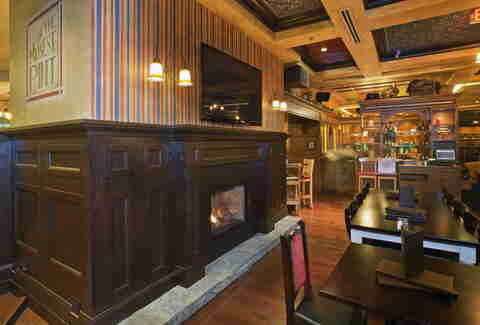 Fado’s Chicago outpost was built around the original bar from one of McGill’s south-of-Dublin haunts. A typical build will also include bric-a-brac: whisky jugs, postage scales, oil paintings, and other flea market-sourced whatnots meant to give the pub a lived-in look from day one. It’s like Applebee’s, except you have to honor the coach of the local hurling team. At workshops around Dublin, everything gets loaded into 40ft steel crates that Nicky Sobotka is probably doing something sketchy with as you read this. Those are stacked on trucks, trains, or massive freighters, then hauled directly to the location, whether that’s Marseille (O’Brady’s), St. Louis (Tigin), or Helsinki (Mulligan’s). This requires a precise bit of timing; the installation crew can’t install the bar before the floorboards, so pieces are packed & shipped in a very specific order. As the containers arrive on location, a totally separate crew cracks ‘em open and begins fitting the interior into the waiting space. 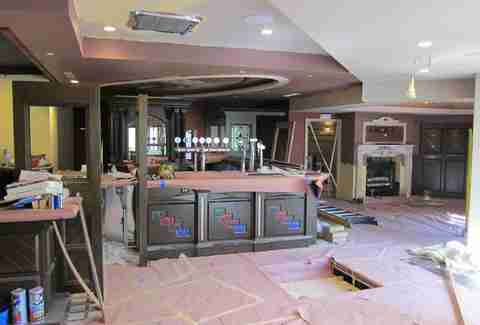 Once the light fixtures are beaming, and the last coat of paint has dried on the walls, the crew will vanish, leaving behind a pub more Irish than its future patrons could possibly guess. Ah, yes. The million-dollar question. Why are restaurateurs spending millions to import their pubs from the Emerald Isle when some dude named Johnson could do it for a quarter of the price? The answer, dear lads & lasses, is one part restaurant business, two parts Celtic pride. "Sending the love back to Ireland"
As you surely guessed, most people who open Irish pubs are Irish themselves. 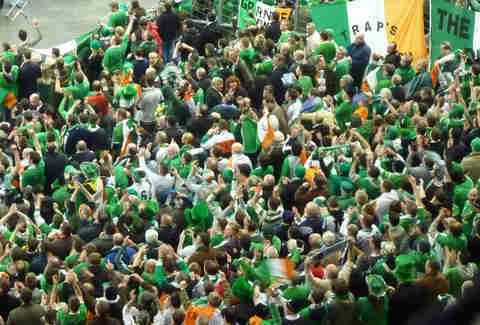 Like every other Irish person ever, they’re deeply loyal to their birthright. “Some of our clients have left Ireland two generations ago,” Fagan told me. “But they want to make sure that people [there] get the work. They do it to ensure their dollars make it into Irish pockets. They call this 'sending the love back to Ireland.'" 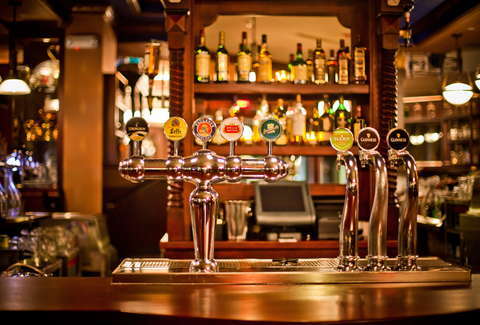 Not that locally made counterparts are any less real-deal, but with decades of experience, companies like IPCo., GGD Global, & OL can nail the lusted-after Irish pub vibe better, quicker, and cheaper than a proprietor can on his own. And beyond good service, there’s nothing more important than that aesthetic. “The customers don’t necessarily notice or appreciate all the details, but they do feel them,” says McGill. Plus, when the pub opens, the publican can proudly advertise that his establishment was “made in Ireland.” Nothing makes a pint taste better. 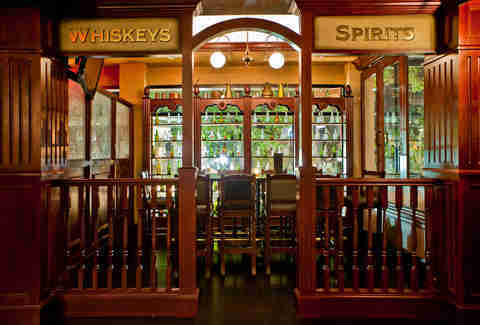 When it comes to Irish pubs, authenticity is currency. According to IPCo., “Sales per square foot in ‘authentic pubs’ are exceeding the US average by a factor of two.” GGD’s website claims that the more realistic a pub feels, the more money it can make. Heverin says that per square foot, an Irish pub is more lucrative than any other type of restaurant. Where are these pubs? Am I in one right now? Maybe! There’re Irish-made pubs in Indiana, Iraq, India, and a bunch of other places that don’t even start with “I.” From multi-story buildings to tiny storefronts (called “snugs”), these companies can build pubs almost anywhere. Fagan managed a build-out in Halifax, Nova Scotia once. Heverin traveled 15 hours south of Moscow to erect Wright Brothers in Belgorod, Russia. Believe it or not -- and you should go ahead and believe it! -- IPCo.’s biggest office is in Dubai, where 15 employees keep up with a barrage of contracts for pubs, hotels, and even a mock village. This isn’t even counting St. Patrick’s Day. McGill says that a Fado Pub can expect “on average, about two weeks of business” during the holiday. 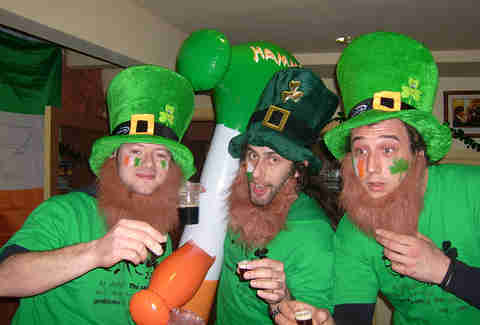 Fagan estimates some pubs can net a month of revenue on the St. Paddy’s weekend. It’s also a great family investment to pass down for generations, says Heverin. “You won’t become the trendiest club in town, but you’ll be around for 100 years.” Fagan states it even more plainly: “Irish pubs don’t go away unless the owner decides to close the doors.” A pub becomes a part of its community -- rare stability in the hospitality industry. Dave Infante is a senior writer for Thrillist, and will not kiss you, no matter how Irish you claim to be. Follow @dinfontay on Twitter, Instagram, and Snapchat.